Thai massage is an integral part of the traditional/folk healing arts of Thailand. It has some of the same influences and sources as other southeast Asian sciences, such as Ayurveda and Traditional Chinese Medicine. In Thailand, the healing arts, like the martial arts, are handed down carefully in oral tradition through extensive training with an Ajahn (อาจารย์, Teacher). Hi, I’m Leslie. In 2005-6 I dedicated 18 months of volunteer service in Thailand, and was immersed in the language and culture. Now, ultimately I have dedicated myself to Thai massage and yoga full-time. 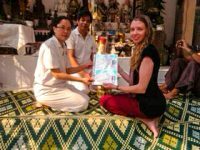 I am a Licensed Massage Therapist and a yoga teacher, and I considered both of these achievements to be important steps as a serious practitioner of Thai massage in the context of the United States. The Thai massage teacher who has influenced me the most is Sararut Pilakun, a traditionally trained Thai doctor based in Chiang Mai, Thailand. Some of the lessons I have learned from her are about using your intuition and controlling your empathy; drawing strength from meditation; and putting faith into the healing arts. I have witnessed her remarkable gift for healing many times. She has encouraged me to develop my therapeutic practice and to teach the knowledge that I have accumulated. 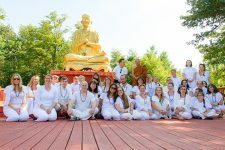 My formal training includes the Thai Institute of Healing Arts, which no longer exists; my teachers from that school can now be found in Chiang Mai at the Thai Massage and Folk Medicine Training Center in as well as in Virginia at the Thai Massage Learning Center. I have also studied with the dedicated family at the SVG Thai Massage Training Center in Chiang Mai, Thailand (part of the Old Medicine Hospital family). I had the pleasure of meeting and learning from the famous Ajahn Pichest Boonthumme for a day. Thank you to the many skilled teachers and therapists that have influenced the depth of my understanding of Thai massage! You are too many to name. Try Thai massage, this could be the next big step toward living your ideal life!